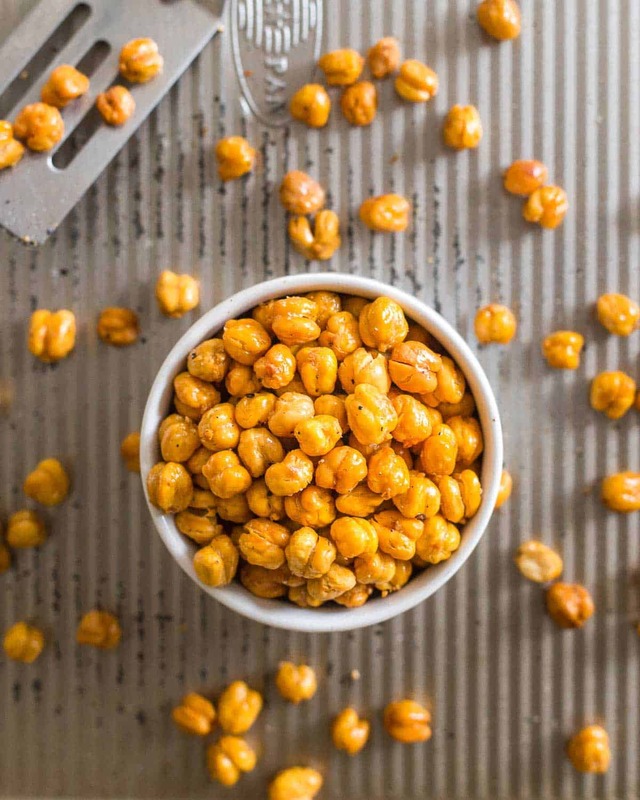 Roasted chickpeas are snack-worthy little protein-packed bites that make a fun appetizer alternative to nuts or a great salad topper. Use this simple tutorial and recipe to learn how to roast chickpeas and get them perfectly crispy and crunchy every time! The seasonings can vary to your liking but the method remains the same. Roasted chickpeas are a totally underrated snack in my opinion. When they’re made correctly, they’re crispy and crunchy and rival any mixed nut bowl or Chex mix type of party appetizer all while being lower in fat and high in protein and fiber. The seasoning options are endless too. You can make them sweet like these cinnamon toast crunch roasted chickpeas, you can mix sweet, savory and spicy like these spicy cinnamon roasted chickpeas and on and on. Now I’m dreaming of a taco-seasoned roasted chickpea. Mmm…. 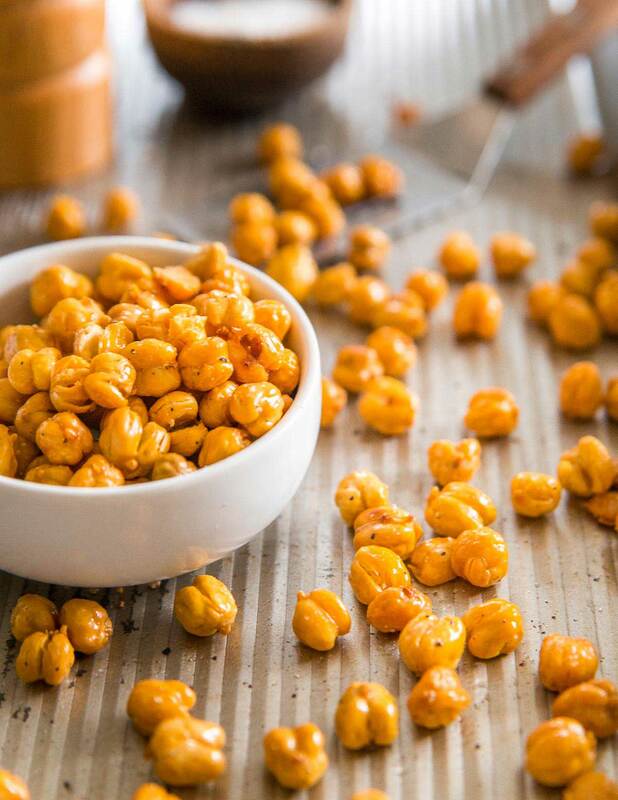 Making roasted chickpeas is easy but there are a few simple tricks to get the absolute crispiest and crunchy result you can’t skip! Let’s go through it all and learn how to roast chickpeas the right way. What Do I Need To Make Roasted Chickpeas? The ingredient list is simple. I’ve included a basic recipe for roasted chickpeas below but like I mentioned above, you can add any and all seasoning combinations you’d like so play around! That’s it! I bet you have all those ingredients on hand, don’t you? Can You Roast Canned Chickpeas? Yes! I hardly ever use dry beans. Unless I’m using my Instant Pot for something like this Instant Pot tomato white bean recipe, I tend to stay away from dried beans. They just require too much time for soaking and too much forethought, I’m more spur of the moment in my cooking! Canned beans are perfectly fine for roasted chickpeas and they make things nice and simple! How Do You Make Crispy Roasted Chickpeas? Let’s go over each one of those. I know this part is tedious. I used to skip it and when you’re making things like this chickpea fall salad or this Moroccan lamb lentil stew with chickpeas, it’s not worth it. But, when the recipe is solely focused on the crispy and crunchy chickpea itself, take the 10 minutes (that’s how long it took me – I literally timed it) and peel them. Believe me, you’ll thank yourself when you taste the end result. Nothing complicated about this part of roasting the chickpeas either, just something a little different than what you’re probably used to when roasting something. The naked chickpeas (aka- before you pour the oil and seasonings on them) get pre-baked. This helps them start their journey to crispiness before getting “wet” with seasonings. You’ll pull them out half way through roasting, toss with the oil and seasonings of your choice and then continue roasting. The post-bake cool is an exercise in patience. Instead of pulling them out of the oven and trying to devour them right away, turn the oven off, crack the door and let the chickpeas cool on the baking sheet for at least 10 minutes. This helps them crisp up even more. How Do I Store Roasted Chickpeas? If you actually have leftovers (I’d put bets on this not happening though), the best way to store roasted chickpeas to maintain their crispiness is in a paper bag on the counter. Don’t put them in an airtight container and don’t refrigerate them! How Else Can I Use Roasted Chickpeas? Besides eating them by the handful, I love using roasted chickpeas to top salads. Swap them for nuts next time and try it out! You can also try them in something like these shrimp Caesar salad stuffed sweet potatoes, I love the added crunchy texture they bring to that dish. Looking for even more recipes that use chickpeas? Try this chorizo chickpea skillet, this chickpea pesto sandwich or this chana masala. 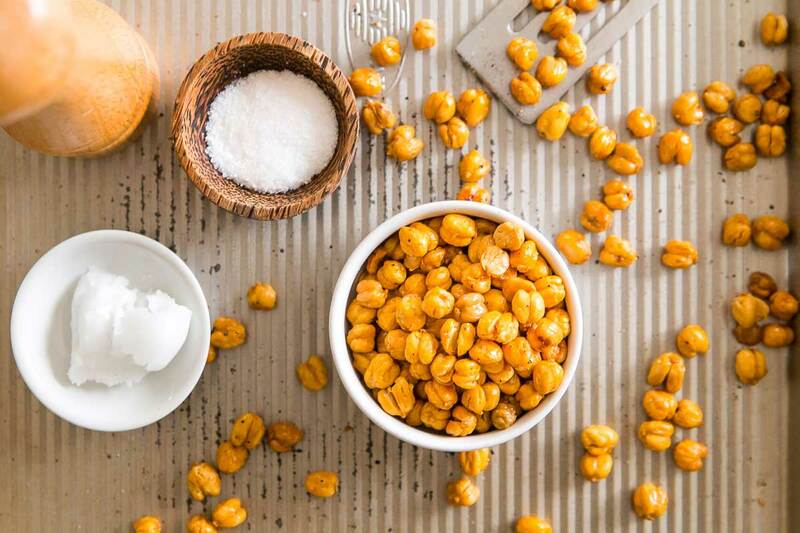 Learn how to roast chickpeas for crispy, crunchy snack-worthy little protein-packed bites. A fun appetizer alternative to nuts or a great salad topper. Preheat oven to 400°F convection roast or 425°F if you don't have a convection roast setting. Spread drained and rinsed chickpeas out on a dry dish towel, gently pat dry. 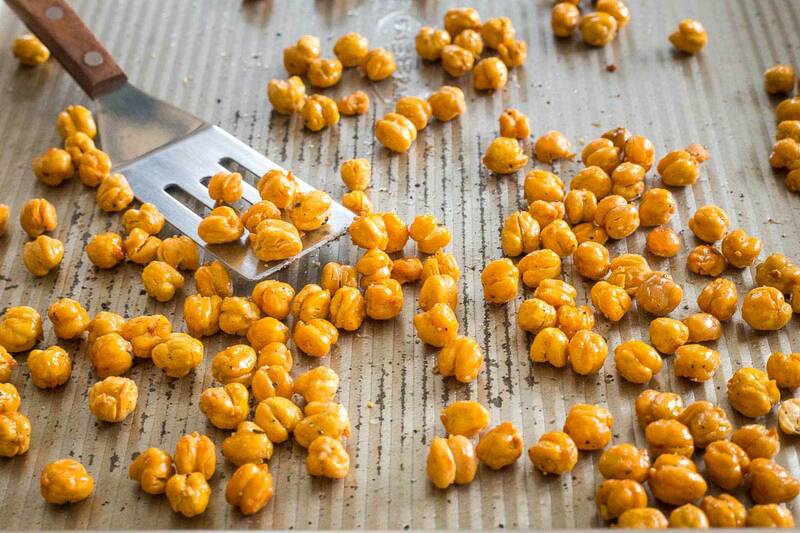 Peel skins off each chickpea. This will take about 10 minutes, it's tedious but worth it and necessary for crispy roasted chickpeas - don't skip this step! Spread peeled chickpeas out on a baking sheet and roast for 10 minutes, shaking the pan once so they don't stick. Remove chickpeas from the oven and pour the coconut oil mixture over top. Season with salt and pepper and toss well to combine making sure all the chickpeas are evenly coated. Return the baking sheet to the oven and roast for an additional 12 minutes, tossing once half way through baking. Turn the oven off, open the door a few inches and let oven cool with the baking sheet still in the oven for at least 10 minutes. Once cooled, chickpeas will be crispy and ready to eat! See Cinnamon Toast Crunch Roasted Chickpeas and Spicy Cinnamon Roasted Chickpeas for more roasted chickpea versions. Hi! Nice recipe. Can I use olive oil instead of coconut oil? Thank you!! You can, but oils with higher smoke points like coconut oil, avocado oil or grapeseed oil tend to be better for roasting. OMG. Peeeeeeeling them!?!? That’s what I wasn’t doing and I so didn’t like the result. I’m so excited to make some more. Thank you for this!!!!! That’s the trick ;) Enjoy! I love this recipe – thanks for sharing the technique. Yeah – peeling the skins off takes some time, but I put on a pod cast and get into the zen of it – plus I go ahead and make 2 cans worth at a time. Great GF substitute for croutons on salads and in Buddah bowls. ….and the chickpeas DO store well in a paper bag. Exactly – zen out with a tv show or podcast :) Glad you liked them!